I received an interesting email on Saturday from Bob Hoye at Institutional Advisors regarding "Currency Wars". Currency wars are very much the talk of the times. This was also the case in the last postbubble contraction when many countries sought to enhance exports through depreciation. And "beggar thy neighbour" policy was a feature of the early 1930s as well. This time around it is an intelligentsia stricken by the fear of deflation, trying to ramp up anything that trades. But commodity markets and producer prices have not been "accommodating" central bankers. Instead there has been rampant inflation in financial assets, which has reached excessive levels of speculation. Clearly, it is a "beggar thy taxpayer" policy. Bob gets credit for the phrase "beggar thy taxpayer" but I have been thinking along those lines for quite some time. Pension plan assumptions are always on my mind and a Financial Times article earlier this month puts a spotlight on the problem. Please consider Draghi’s QE Strains German life Assurers. In a report published on Wednesday, Moody’s said the “profitability and solvency” of the industry in Germany would come under further strain from the European Central Bank’s bond buying. Similar products are sold across Europe, but the guarantees have been particularly generous in Germany. To help cope with the pressure, insurers have been reducing the returns they pledge to policyholders. The maximum guarantee sanctioned by authorities in Germany is now 1.25 per cent. The industry has also sought to sell more products that have no guarantees — effectively placing the investment risks with policyholders instead of shareholders. However, the insurers still need to meet commitments from policies sold in previous years, for which the guarantees have been as high as 4 per cent. 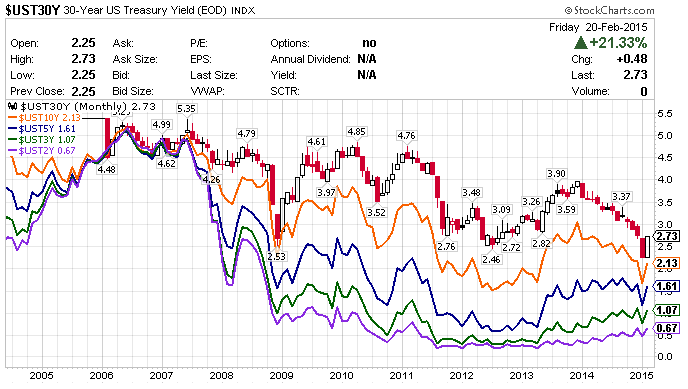 Insurers have made 4% promises but long-term bonds yield close to zero. Benjamin Serra, senior credit officer at Moody’s said "They are increasingly constrained by the high level of guarantees sold in the past." 2015 will be a “pivotal and challenging year” for Germany’s life assurance industry. Moody's maintained a “negative outlook” for the sector. As of Friday, 10-year German bonds yield 0.39%. Five-year German bonds yield -0.07%. Recall that the ECB pledged on January 22 to buy 60 billion euros ($68 billion) of assets a month for at least 19 months in its inane pledge to avert deflation. Buy from where? Reuters asked an interesting question last Friday: ECB's Draghi wants to buy bonds, but who will sell? "We prefer to hold on to them," said Antoine Lissowski, deputy CEO at French insurer CNP Assurances. "The ECB's policy ... is reaching its limits now." Insurers and pension funds typically buy long-term debt. They could make hefty profits selling to the ECB. But the money would have to be re-invested in other bonds whose yields would be much lower than their long-term commitments to clients -- a regulatory no-no. "If we were to sell bonds, we would make huge capital gains, but we will then have to reinvest that money at a yield of 0.5 percent, set against liabilities at 3.50-3.75 (percent)," said Bart de Smet, the CEO of Belgian insurer Ageas. RBS strategists see a 40 percent chance that ECB purchases would help turn German 10-year Bund yields negative this year. In the US, pension funds have not made 1.25% promises or even 4% promises, but rather 7.0%+ promises with the 10-year bond yielding 2.13%. Annuities promise 6% or so. How you get 6% in a 2% world? The correct answer is: you don't. But insurers and pension plans try, by taking risks. And the more risk they take, and the more margin they use, drives prices higher and higher into bubble territory. 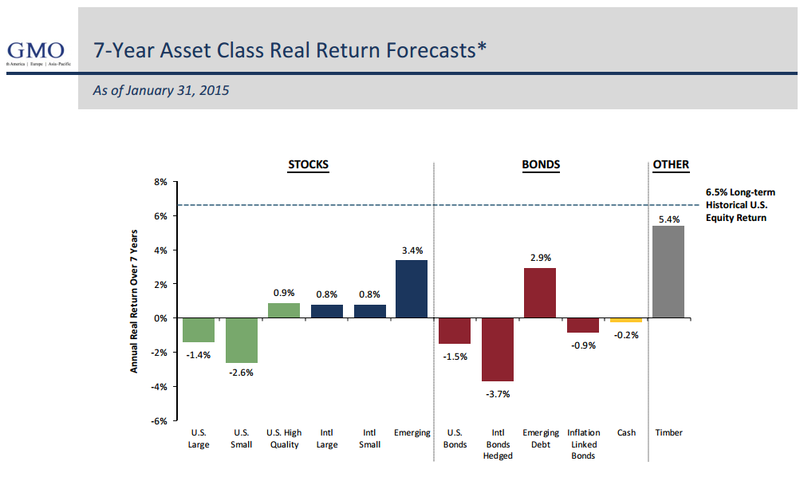 As of January 31, 2015, Stock and bond prices are so stretched that GMO's 7-Year Asset Class Real Return Forecast shows negative real returns for seven years in US equities and bonds. "The chart represents real return forecasts for several asset classes and not for any GMO fund or strategy. These forecasts are forward‐looking statements based upon the reasonable beliefs of GMO and are not a guarantee of future performance. Forward‐looking statements speak only as of the date they are made, and GMO assumes no duty to and does not undertake to update forward‐looking statements. Forward‐looking statements are subject to numerous assumptions, risks, and uncertainties, which change over time. Actual results may differ materially from those anticipated in forward‐looking statements. U.S. inflation is assumed to mean revert to long‐term inflation of 2.2% over 15 years." As of December 31, 2014 GMO managed $116 billion in assets. In the US, pension plans have aggressively shifted from investing in AAA rated bonds to equities and junk bonds because yields in US treasuries and AAA rated corporates is not high enough. Denial that this has happened is nearly everywhere one looks. Of course the Fed, and most others, cannot and will not see a bubble until it bursts wide open. Even if the air is let out slowly (something that has never happened in practice), negative real returns, and perhaps zero nominal returns for seven years is the only other plausible outcome unless one expects an even bigger bubble coupled with even longer negative returns in the future. I will do a follow-up on this broken model later this week with a look at US pension plans, especially State of Illinois promises that absolutely cannot be met.